A white, wood picket fence is an American icon. These fences have been around since the founding of our nation and were originally used as a way to mark property boundaries. Later the picket fence became associated with prosperity and it is still in use across the country. A wood or vinyl picket fence is a very versatile style. There are many different style options to add a pleasing aesthetic but it can still keep your pets and children safely in your backyard. Some people call it a “friendly fence” because it has an open weave and a low enough height to let your neighbor say hello. Marking the boundaries of your property. A vinyl or wood picket fence is great as a backyard or property fence. They look great and provide a bit of privacy as well. Adding beauty to your home. Nothing adds to your property value like a well maintained and professionally installed picket fence. It gives a property a certain homey feel that buyers respond to so they definitely increase your homes curb appeal. On the flip side, nothing will hurt your homes chances of selling like a poorly maintained, dilapidated fence. Keeping your little ones safely in the yard. Whether you have small children or pets, you have to make sure they have a safe place to play. A picket fence can provide them the security they need while still letting you keep an eye on them. Keeping unwanted visitors out. A picket fence may not add as much security as a privacy fence but most people don’t need it too. If you want to keep wild animals, bored neighborhood kids and solicitors out of your yard then a picket fence fits the bill and looks good doing it. Cost Effective – Picket fences are usually constructed using wood and sometimes vinyl, which are two of the most inexpensive fencing materials. When compared to stone or metal fences, they take less time to install and cost much less up front. Environmentally friendly – Wood fences tend to blend right into the yard that they surround. They fit into neighborhoods, commercial settings and they look good on their own as well. If a new homeowner doesn’t like the look of the fence, they can use it to border their landscaping or just pull it up and let it compost instead. You can’t say the same for fences that are made from metal, vinyl or stone where disposal can be a real problem. Versatile – The picket fence design offers much more variety in styles than either metal or brick. You can make your fence slats into any shape or size you want. You can paint them any color you want or just seal them so the natural wood grain shows through. You can do anything you want with a picket fence. Needs regular maintenance – Wood is easily damaged over time whether it is through regular wear and tear, storm damage, mildew or the occasional broken slat where you can never figure out how it happened. If your picket fence is made from vinyl then it can get by with a yearly inspection and the occasional wash but wood needs to be cleaned, repaired and painted on a regular basis. Is susceptible to rot – If you don’t correctly stain and seal your wood picket fence then it will let water in. Over time that will cause the wood to rot and fall apart. If you find any rotted pieces on your fence they need to be immediately removed and replaced before it spreads. Can sink and warp over time – When a wood fence is not properly maintained it will start to sag. If it is left that way for very long, the wood will warp and the fence will fall apart. 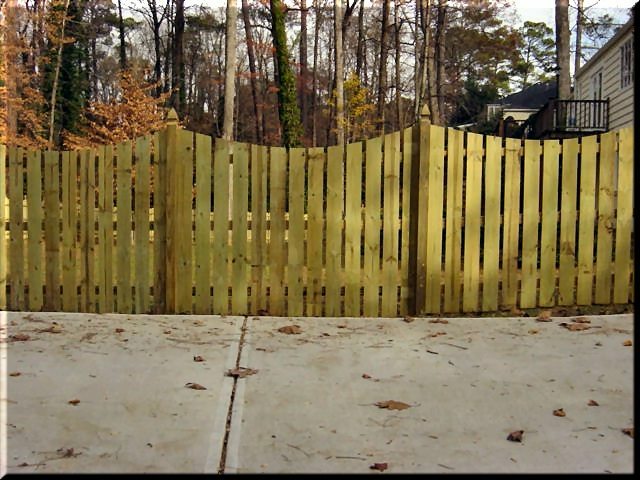 Our wood or vinyl picket fences are constructed with top quality materials by expert Atlanta fence installers. We back our picket fence installations with a 10 year warranty against defects in workmanship and materials. In addition, FenceWorks of Georgia will exchange up to 15% of the pickets within ten years of contract date – contact us to learn more. Call us today at 770-452-9900 to talk to a fencing expert and get a free estimate.